Last summer, Antoine Griezmann was all set to join Barcelona, but in the end, he decided to extend his stay at Atletico Madrid and signed a new contract with the Europa League winners. In a surprise new development, the France international is once again linked with a move to Camp Nou. It was L’Equipe who first relaunched the report last weekend and a large number of Barcelona fans have told the Catalan media, via polls and social media, that they’re not interested in the player. 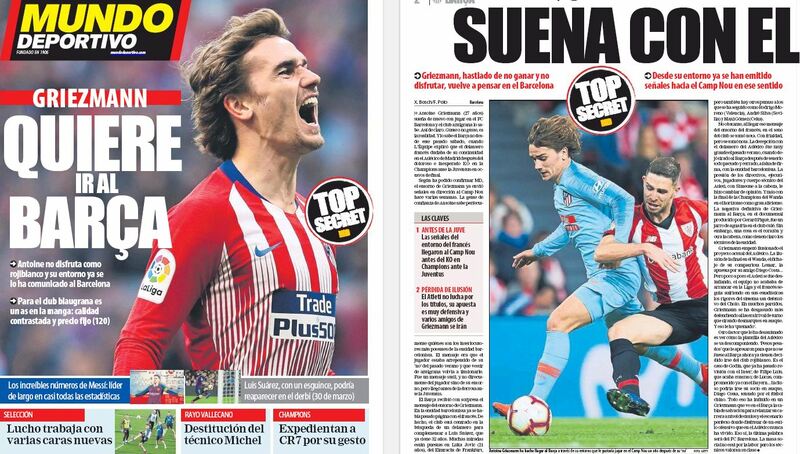 However, that has not stopped the World Cup winner from being linked with a move to Camp Nou and Griezmann gets a mention on today’s front page of Mundo Deportivo. A ‘Top secret’ report claims the 27-year-old’s entourage has already contacted Ernesto Valverde’s side regarding the player’s desire to join them in the summer. This was communicated several weeks ago, even before the second leg clash against Juventus. Barcelona received this message with ‘surprise’, but it was noted at the club as they are in search of a new centre forward in the upcoming window. Griezmann was very excited to start this season at Atletico, but Diego Simeone’s defensive system has forced him to end up defending more rather than posing an attacking threat to the opposition. Mundo explains another factor is that those key players who convinced him to stay at the Spanish capital club in 2018 could be heading towards the exit door themselves. This includes Diego Godin, Filipe Luis, Lucas Hernandez and Diego Costa. This, coupled with Atletico’s position in the league and the Champions League elimination has influenced the former Real Sociedad star to relaunch his career at Barcelona, where he can play offensive football and also have a better chance of winning more trophies. The final decision on Griezmann lies in the hands of Barca because they will have the last word this time.